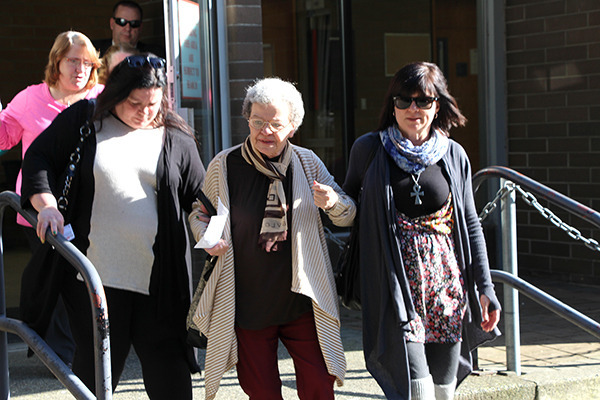 Dec. 8, 2014 10:00 a.m.
Gasps could be heard in the courtroom on Monday morning as the accused murderer of Kathryn-Mary Herbert of Matsqui and Monica Jack of Merritt made his first appearance in Abbotsford provincial court. The room was packed with about 30 family members of the two girls, including their mothers, and many appeared shocked when they saw Garry Taylor Handlen, 67. The only photo that most have seen of the Ontario man is almost 40 years old, showing him with a thick head of dark wavy hair. Now, Handlen has grey thinning hair, a pot belly and wears glasses. “He looks a lot older than I thought he would,” one court observer was overheard saying. The appearance took less than five minutes. Handlen, wearing a prison-issued red jumpsuit, had his next court date set for March 2, at which time his next appearance will be scheduled. He remains in custody, having been charged with the first-degree murders of Kathryn-Mary, 11, in 1975 and Monica, 12, in 1978. It is not yet known when his bail hearing will take place. 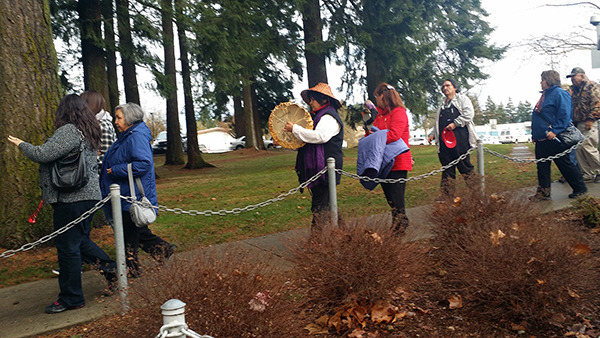 Both Kathryn-Mary’s mom, Shari Greer, and Monica’s mom, Madeline Lanaro, declined to speak to media outside of the courtroom, but a traditional First Nations healing ceremony was conducted in the parking lot of the Abbotsford Courthouse. Kelly White of the Snuneymuxw First Nation, one of the co-founders of the Women’s Memorial March for Missing and Murdered Women, led the ceremony. Each mom was draped in a “star quilt” adorned with thunderbirds signifying butterflies and the transformation of life, as they were surrounded by their families. Drumming and prayer followed. White said the idea of the ceremony is to bring strength and healing to the families, and she thanked them for allowing that to happen. “We appreciate them … for allowing us to come over during their suffering time to permit us to create a healing process for them,” she said. Handlen was arrested in Surrey on Nov. 28, and police held a press conference on Dec. 1 to announce the two first-degree murder charges. They also released a photo of Handlen as he would have appeared in the 1970s around the time of the murders. Kathryn-Mary was last seen in the area of Townline and Marshall roads in Abbotsford on Sept. 24, 1975, and her remains were discovered on Nov. 17 of that year near Harris Road in an undeveloped area of Matsqui First Nations. Her skull was fractured and her jaw was broken. The autopsy was not able to confirm whether she had been sexually assaulted. Monica vanished on May 6, 1978 while riding her bike along Highway 5A near the Nicola Ranch in Merritt, B.C. Her remains were found on nearby Swakum Mountain in June 1995. An Ontario weekly newspaper reported last week that Handlen had been living in a small community there for the past decade. The Minden Times reported that Handlen was known in the community of Minden, a town of approximately 5,500 people located about 200 kilometres northeast of Toronto. Minden Times reporter Angelica Blenich wrote that Handlen could often be seen puttering around his yard on Anson Street in Minden or drinking at local bars. She quoted a neighbour as saying that Handlen was a “quiet, solitary soul” and he had never heard anything negative about him. The bar owner asked Handlen to stop coming to the bar and didn’t see him again until 2013, Blenich reported.